Perhaps the most famed hole in golf, the par 4 17th at the Old Course at St. Andrews was C.B. Macdonald’s inspiration for his template hole “the road” which first appeared in the states at Piping Rock. Macdonald spent his college years studying at St. Andrews University and learning the game of golf with the help of Old Tom Morris, with whom he logged plenty of rounds at the Old Course. St. Andrew’s road hole was originally designed as a par 5, but later was changed to a par 4 to accommodate for technological advances. Typically a long par 4 or a short par 5, a road hole has some easy to identify characteristics. Off the tee the original at St. Andrews has a hotel that guards the dogleg, penalizing any tee shot that tries to cut off too much. To replicate this, Macdonald and Seth Raynor would often put a bunker or hazard along the inside of the dogleg. On the approach, players must navigate a deep pot bunker that sits in the middle of a shallow but wide green complex that typically runs diagonally from the right to left. At St. Andrews immediately behind the green is a road which is out of bounds. To simulate this, Macdonald and Raynor would often place a bunker behind their road hole greens. The bunkering and shallow green make the long iron approach to the green a very difficult shot. In my opinion, the road hole template is the toughest par 4 design in the world as it requires a player to hit excellent shots and utilize strategy in order to make a birdie. Whether a par 4 or par 5, a good way to look at a Road Hole is a par 4 ½ where a 4 is like a birdie and a 6 is a bogey. An ideal tee shot hugs the inside of the dogleg bringing the hazard or bunker into play. If pulled off, a tee shot down the right side allows a player to hit an approach to the shallow green without having to go over the deep pot bunker that guards the green. A tee shot to the left side, away from the hazard forces a player to hit a long-iron approach, over the pot bunker to a shallow green. A common spot for a player to bail out is short and right of the green, leaving a tough up and down for par. Possibly the best par 4 in the world, the 17th has given the world’s best golfers fits since its creation. The dogleg right requires a player to hit a tee shot over the Old Course Hotel which will leave a mid to long iron approach into the shallow green. From the fairway, a player’s long iron game faces an immense test as a treacherous bunker guards the front of the green and O.B. lies right behind. Dubbed “St. Andrews”, the 7th at National Golf Links of America is a great birdie opportunity, but disaster awaits a player that hits their ball in the wrong spot. The dogleg left is guarded by tough fairway bunkers on the inside of the dogleg. If you find one of these it quickly turns into a 3 shot hole and a much more difficult birdie. The approach shot features one of the deepest road bunkers in American golf. Don’t miss long or you will find yourself in the back bunker with the green that slopes away from you. 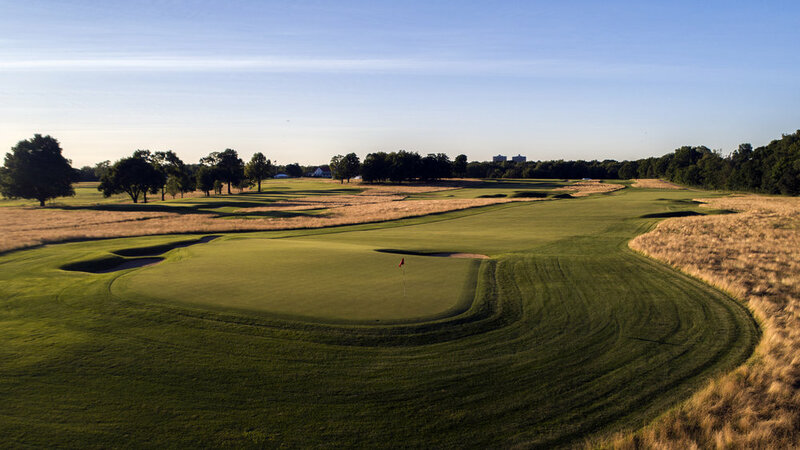 Part of Chicago Golf Club's tough start is the Road Hole second. Off the tee the ideal line is down the right side which risks the fescue grass. The left side of the fairway has a series of deep fairway bunkers. The approach to the green gives players the first look at one of the many severe false fronts at Chicago Golf. It makes this approach especially difficult into this long par four. The bunker that guards the left side of the green makes any back left pin a difficult shot to hit. The 2nd hole a Road Hole, looking back at Chicago Golf Club. As tough of a par 4 as you can find, the 10th at Shoreacres recently had a back tee added behind the road (fittingly). From the back tees carrying the ravine on the right is a tall task for even the longest players. A good tee shot sets up a mid to long iron approach to a very shallow green. When the conditions are firm and the pin is behind the bunker it is nearly impossible to have a shot hit at the pin hold the green and avoid the runoff areas. The ravine on the 10th at Shoreacres which protects the aggressive line to the green. A look at the 10th green from the 8th green at Shoreacres. The 8th hole at Fishers plays as a par four from the back tee box and a par 5 from the members tee. The prevailing wind is blows into and right from the players. The ideal line is up the right side of the fairway to setup the angle to approach the green. Obstructing this line is the ocean on the right as well as a fairway which slopes severely to the left. Seth Raynor’s Camargo Club in Cincinnati has a par 5 road hole that is missing much of its original luster. A good tee shot cuts the corner of the dogleg right that is guarded by bunkers. The 17th's green is a fraction of the size it was originally designed for, it should extend far to the left. Players must navigate the hazard on the right on this tough par 4 at Seth Raynor’s Yale Course. A good drive will lead to a mid-iron approach to a green with a small but treacherous front bunker, guarding the green that moves from left to right, preferring a fade approach shot. The 5th at Seth Raynor’s Blue Mound C.C. features a par 5 road hole, a great birdie opportunity. An ideal tee shot avoids the bunkers along the right side of the fairway, which will leave a long-iron approach to the green. When I played this hole my tee shot found the intermediate cut of rough on the left side. This forced me to run the ball up on the right side of the green, leaving a lengthy eagle attempt. The tee shot at the 5th at Blue Mound. Meanwhile, my friend was able to cut the right side and hit a high approach at the pin that sat over the pot bunker. The approach to the 5th at Blue Mound. 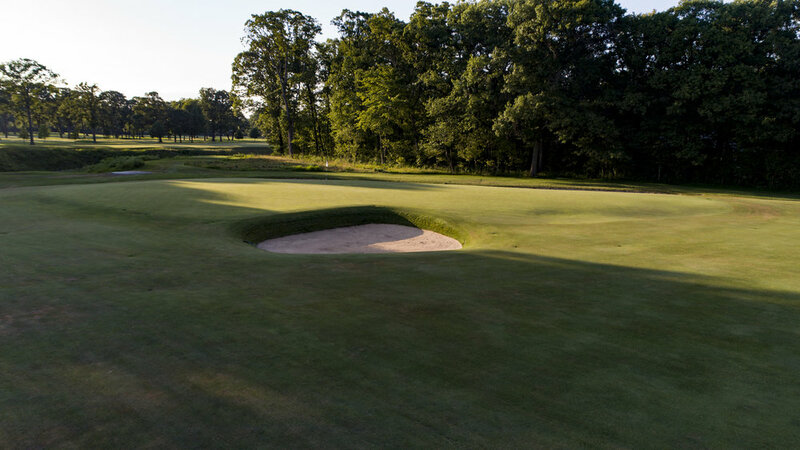 Long is not a good miss at Blue Mound, as the back bunker is extremely deep and the green sloping away from the player will make for an extremely difficult up and down. The right side of the 5th green at Blue Mound. At the C.B. Macdonald designed SLCC, the 4th dubbed “St. Andrew’s” is the road hole. The par 4 tees from a slightly blind box and a good tee shot is up the left hand side of the fairway towards the fairway bunker. From the left the green which angles from left to right opens up for an ideal uphill approach. Unlike most American road holes, St. Louis C.C. 's has a road behind it! The tee shot at SLCC's 4th. A look at the 4th green and pot bunker. Tom Doak and Jim Urbina's interpretation of the Road Hole at Bandon Dunes’ Old Macdonald Course is the par 4 variety and doglegs to the right. Their version is nearly identical to the Old Course, except for the tee shot, which isn't blind. 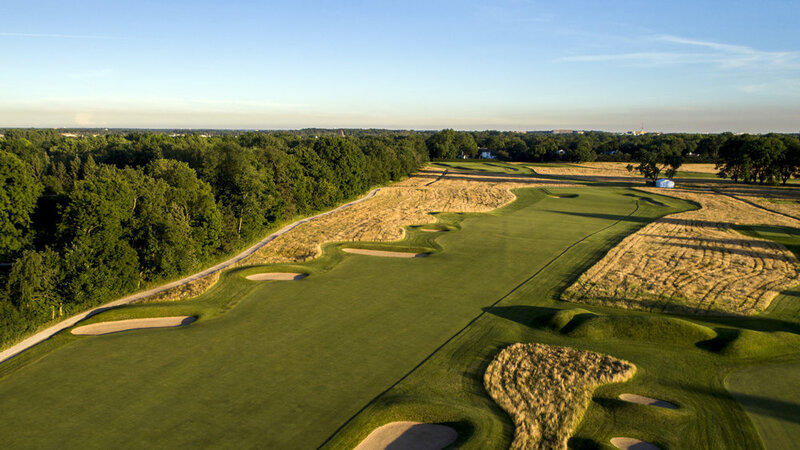 The right side of the fairway is guarded by fescue and bunkers which causes many players to bail left and leave a longer and tougher approach to the green. The green is guarded by a great pot bunker and is the traditional shallow green which moves back and to the left. This road hole is known only to insiders at Rob Collins’ 9-hole masterpiece in South Pittsburg, TN. Playing from the tee that overlooks the 9th, this road hole is a brute. Off the tee, a player must avoid a large trap and lake on the right side to set up an approach to a tough and well-protected green. The green is an interesting complex with a redan on the left side and a punchbowl on the right. The deep pot bunker in front makes for a very difficult up and down. The green at Sweetens Cove is guarded by a deep pot bunker. Have another road hole that we should feature? Drop us a line.